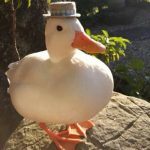 « Trekkin’ Abroad: Norman D.
And know that there are ducks out there wearing hats…. Thank you for leaving the pictures until I had clicked through to the full post. This provided a great sense of dramatic tension and I positively hooted with delight when the ducks were finally revealed to me. 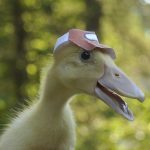 The fourth duck is the best duck. The one in the straw boater with the blue ribbon around it. I like bowler hat duck personally, the ‘read more’ readily adds to the frisson. 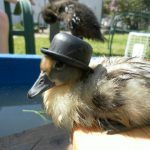 I literally cannot choose which is my favourite duck in a hat. I have to hand it to you, Kev, you don’t post often but when you do it’s a cracker / corker / top o’ the nines my friend. 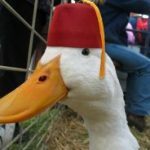 If you click on the ducks, it takes you to a new page with the picture of the duck and a big blue title above it that I assume is the duck’s name. 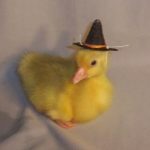 The yellow duckling in the pointy hat is called 9C3OwoO. It’s the most perfectly adorable name. I don’t like how stern Fcb5Cuk is. What has he seen? What have his viewing duck eyes viewed that made him look so cold and unapproachable? You could find out by having some duck eyes fitted to your increasingly eye-heavy face. Then you’d get to see what Fcb5Cuk has seen. Unless it would make you stern as well, in which case you’d better not. Now that’s a great idea. If I had duck eyes I could eyes all the ducks and see everything they do. I’ll get my top eye men right on it. 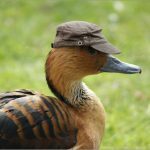 You’ll go QUACKERS when you get to take a BEAK at what ducks can see. Since you got back from France you’ve changed. Go look in the mirror and SHAME yourself. I just see an extraordinarily handsome man in a beret. What? Sorry, I missed that. I was busy looking at myself in the mirror. Now I hear you’ve fudged off to Horsham. You’re all over the place, mate. You need to slow down. I’ll tell you where he’s not though… In Leeds. That’s an excellent point, and one which should maybe be discussed in some kind of online forum. I’ve left Horsham now (where, by the way, there were no horses at all). I think it’s important to clarify that I did not fudge off there, nor have I fudged off anywhere, to the best of my knowledge. I did frolic there, though. Did you eat any fudge whilst you frolicked? No. It was a classic fudgeless frolic. The best kind, where you don’t have to wash your hands afterwards. Were you thinking about fudge at the time? Did it cross your mind? Did it jump up and down in your mind? Was it doing the splits? Absolutely not. I was in a state of total fudgelessness, or totes antifudge as the kids call it these days. So THAT’S what that is. There is some graffiti near where I work which has the same thing. I thought it was a reference to some fungal nail cream. You’re thinking of Toes Contrafunge, a powerful and pungent unguent manufactured by Sludge Pharmaceuticals.